As health and wellness continues to make an impact in our country, we often hear concerns from consumers about eating the right things and getting the appropriate amount of fruits, vegetables, grains, dairy, and protein. The main thing is at the end of the day you are getting a balance of all the food groups. However, don’t let it consume you (pun intended). Even people who are diligent about eating a healthy mix of servings will fall short. Don’t worry if you miss a few servings each day; the main thing is that you’re making an effort to eat a balanced diet. When eating your vegetables always try to have a variety of colors on your plate. Whether the vegetables are fresh, canned, steamed, or mashed, the important factor is that you’re getting them in your daily intake. Examples include kale, plantains, red peppers, garbanzo beans, avocado and cucumbers. 100% vegetable juice will count towards your daily intake, but just be sure to read the label for ingredients. 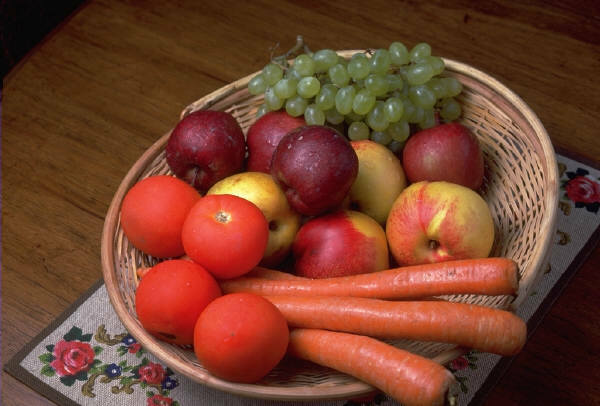 When eating fruit, just like your vegetables, always try to eat a variety of color. Your fruit can be fresh or dried and you can eat it whole or pureed. Examples include apples, mangoes, pears, plums, cantaloupe and grapefruit. 100% fruit juice will count towards your daily intake but just be sure to read the label for ingredients. When choosing your grains, make sure that you know the difference between the two categories, whole grains and refined grains. Whole grains consist of the full-grain kernel, bran, germ and endosperm. Refined grains go through a process called milled, which removes the bran and germ. Examples of whole grains include whole-wheat flour, bulgur, oatmeal and brown rice. Refined grains examples are white flour, flour tortillas, pitas and white bread. It’s best to eat whole grains because the carbohydrates are absorbed slowly. This helps regulate the blood sugar, which in turn keeps you feeling fuller for a longer period of time. Refined grains have the exact opposite effect, where the carbohydrates turn to glucose and enter the blood stream quickly. When choosing any dairy-based products, it is best to opt for fat-free or low-fat milk and milk products. Examples include the basics of milk, yogurt, and cheeses as well as lactose-free and lactose-reduced products and soy products. Products that have little or no calcium but contain milk are not included in this category. When choosing your protein foods, be sure to seek a variety of selections. Aim for lean cuts of meat and poultry, seafood, beans and eggs. The USDA defines a lean cut of meat as a 3-ounce cooked serving of beef that has 4.5 grams or less of saturated fat, less than 10 grams of total fat, and less than 95 mg of cholesterol. Try to include eight ounces of fish each week into your protein source consumption. Remember: The goal is to eat a well-balanced diet most days of the week and exercise when you can. The American College of Sports Medicine (ACSM) recommends adults should get at least 150 minutes of moderate–intensity exercise per week. These recommendations can be achieved through 30-60 minutes of moderate–intensity exercise (five days per week) or 20-60 minutes of vigorous-intensity exercise (three days per week). This same concept can be applied to eating a well-balanced diet because overall nutrition consists of both exercise and nutrition. We all live busy lives but the most important thing for us to do is plan ahead so that we can build a good work-life balance and extend our well-being.